Starting as a self-proclaimed carnivorous meat fridge, Vincent Russo's nutrition program has evolved into a holistic, whole-foods diet. Eat well to look great! When he first started training, Vinny Russo considered himself a "meat fridge," because he was basically a carnivore. Now that he has a few years of contemplative study under his hat, he feels confident in a rounded, whole foods diet. Vinny eats on a 3-day cycle (listed below) that even includes a healthy dessert! He eats 6-to-8 meals per day, but aims for the lucky number 7. "You gotta look at your metabolism as a camp fire," Russo said. "The food you fuel it with is the wood for the fire. Every time you put wood in the fire, your metabolism increases." When he's not in competition mode, he'll enjoy edible delights (like nachos, wings, a beer here and there) but once he's on a program, there is no room for calorie stretching. See how Vinny cleaned out his meat fridge! "You are what you eat, plain and simple. If you fuel your body with foods that provide weak, unnecessary calories, then you will most likely hate the way you feel and look. If you fuel your body with the right kinds of fats, carbohydrates and proteins and understand when to take each macronutrient in, and what times of the day best call for an abundance of a certain macronutrient then you will fuel your body the proper way, leading to a healthy, fit body. Complex carbs, all types of proteins and healthy fats! That's the way to go, and if you do this 90% of the week, then you're allowed to treat yourself for the remaining 10%. "My diet consists of complex carbs in the forms of baked potatoes (sweet or white), brown rice, rolled oats, and multigrain rice cakes. Complex carbs provide a slower and more-sustained release of energy than simple carbs. In their natural form, they contribute to long-term good health, appetite control, and sustained energy levels. "I also throw some simple carbs in there (depending on what I'm training for) in the form of white rice or maltodextrine. Simple carbs give you a quick rise and fall in energy levels and have calories with little to no nutrient value. The simpler the carbohydrate, the faster the glucose releases into your blood. This causes peaks and drops in blood sugar levels, and less stable energy levels in the body. Although these simple carbs have a bad reputation, there are certain times of the day when it is important to consume them (POST WORKOUT!). "My diet also consists of complete forms of protein: beef, chicken, ground turkey, tilapia, salmon, and whey shakes. These proteins provide all of the essential amino acids. I obtain incomplete proteins via: rice, beans, nuts, seeds, vegetables and fruits. "Protein is the most important nutrient needed for optimal development. It is the foundation to every human body, every living cell, and every construct of a DNA strand. I consume protein with every meal and try to make it about 35-to-40 percent of my diet. I prefer whey protein shakes compared to casein due to its rapid absorption rate. It provides the body with the perfect amino acid profile, and you get the most bang for your buck (since it's about 90 percent pure protein). "I'm not a big fan of casein, although it has its value. Casein is a time-released protein, which is advantageous to use if you're not going to have another meal for an extended period of time, or before bed due to your 6-to-9-hour fast. "I take shakes pre- and post-workout. Pre-workout saturates my muscles with protein, preventing gluconeogenesis. The goal of a post-workout shake is to replenish the fuels lost from your workout and to stop muscle breakdown and provide the fuel for muscle growth. This protein shake is taken after a workout (within 60 minutes) in conjunction with simple carbs. Your muscles yearn for fuel and are severely glycogen-depleted, so this is the best time for absorption to occur. "You have an anabolic window within the hour for maximum absorption. Protein cannot be stored in the body, so the simple carbs are used to spike in insulin to help shuttle protein to muscles where they will be used. If carbs are not consumed post exercise, your glycogen replenishment is hindered. 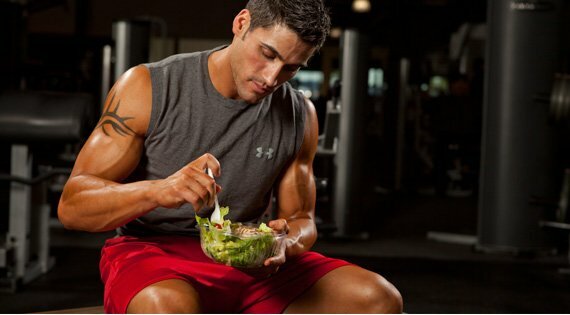 If you do not consume protein immediately after a workout, performance, protein synthesis, and ultimately muscular hypertrophy, will be hindered as well. "The fats I add mainly come from nuts, oats, omegas and all-natural butters (peanut butter and almond butter). Fats tend to be widely overlooked; they help with nutrient absorption (vitamins such as A, D, E, and K), nerve transmission, and maintain cell membrane integrity. They provide raw materials for synthesis of compound nutrients and are crucial for providing EFA (essential fatty acids) the body cannot produce on its own. "These fats provide the body with energy during endurance exercise, in between meals, and in times of starvation. They are the indispensable constituent of cell membranes. The body needs a supply of polyunsaturated fats to assist in assembling strong, functional and elastic cell membranes. Fat provides a service keeping hormone levels in-check and regulates blood-glucose levels and insulin response. "When consumed in excess amounts, fats contribute to weight gain and heart disease. Fats are not created equal! Some fats promote health positively, while others increase risk of heart disease. The main objective: replace bad fats with good fats! "Unsaturated (good) fats decrease the risk of heart disease. Monounsaturated fats and polyunsaturated fats lower total cholesterol as well as LDL (bad) cholesterol, while increasing HDL (good) cholesterol. These fats are found in vegetable oils, salad dressings and margarines made from vegetable oils. They are found in avocadoes, seeds and nuts, and fish (such as salmon). The Omega 3/6/9 fatty acids (mainly associated with fish) play an important role in improving mood, vision, skin, recovery, immune system function, and joint health. "Bad fats consist of saturated fats and trans fats. These fats raise total blood cholesterol and LDL cholesterol. Trans fats were actually invented by scientists who began to "hydrogenate" liquid oils for foods to have a longer shelf life. An overindulgence of bad fats inevitably results in poor health, unwanted body fat, and greater risk of heart disease. "The transition to healthy fats will help you reach your goals, but also improves brain function! Approximately 20 percent of your caloric intake should consist of healthy fats (30 percent would be the upper threshold before becoming unhealthy). Since the body constantly repairs itself from cellular damage, these fats are imperative for repair." Example Cycle: Day 1, Day 2, Day 3 … Day 1, Day 2, Day 3, etc. Dustin Lapray is a writer, journalist, and editor living in Boise, Idaho.